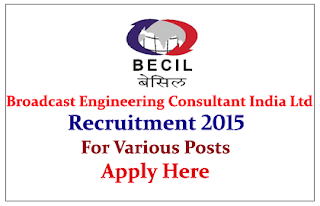 Broadcast Engineering Consultant India Limited is recruiting for various post for the year of 2015. Eligible candidate can apply here on or before 29th May 2015. 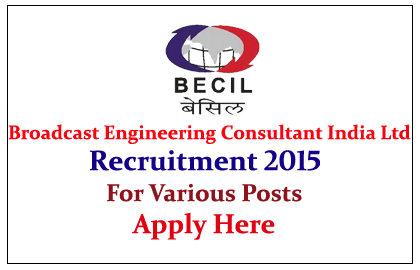 Broadcast Engineering Consultants India Limited (BECIL) is a Public Sector Undertaking (PSU) of the Government of India. BECIL provides broadcast engineering and information technology services in India. BECIL has provided consultancy services to such channels as Malayala Manorama and Times TV and counts among its clients media and broadcast companies such as Hindustan Times, Radio Mirchi, Star TV and Radio City. Eligible Candidates can apply on or before 29 / 05 / 2015, for more details check official notification.